This article is about the computer software. For other uses, see Screen Savers (disambiguation). ".scr" redirects here. For CAD scripts, see CadSoft EAGLE. World Community Grid screensaver that uses idle system resources to help analyze proteins. A screensaver (or screen saver) is a computer program that blanks the screen or fills it with moving images or patterns when the computer is not in use. The original purpose of screensavers was to prevent phosphor burn-in on CRT and plasma computer monitors (hence the name). Though modern monitors are not susceptible to this issue, screensavers are still used for other purposes. Screensavers are often set up to offer a basic layer of security, by requiring a password to re-access the device. Some screensavers use the otherwise unused computer resources to do useful work, such as processing for distributed computing projects. As well as computers, modern television operating systems, media players and other digital entertainment systems include optional screensavers. Before the advent of LCD screens, most computer screens were based on cathode ray tubes (CRTs). When the same image is displayed on a CRT screen for long periods, the properties of the exposed areas of phosphor coating on the inside of the screen gradually and permanently change, eventually leading to a darkened shadow or "ghost" image on the screen, called a screen burn-in. Cathode ray televisions, oscilloscopes and other devices that use CRTs are all susceptible to phosphor burn-in, as are plasma displays to some extent. For CRTs used in public, such as ATMs and railway ticketing machines, the risk of burn-in is especially high because a stand-by display is shown whenever the machine is not in use. Older machines designed without burn-in problems taken into consideration often display evidence of screen damage, with images or text such as "Please insert your card" (in the case of ATMs) visible even when the display changes while the machine is in use. Blanking the screen is out of the question as the machine would appear to be out of service. In these applications, burn-in can be prevented by shifting the position of the display contents every few seconds, or by having a number of different images that are changed regularly. Modern CRTs are much less susceptible to burn-in than older models due to improvements in phosphor coatings, and because modern computer images are generally lower contrast than the stark green- or white-on-black text and graphics of earlier machines. LCD computer monitors, including the display panels used in laptop computers, are not susceptible to burn-in because the image is not directly produced by phosphors (although they can suffer from a less extreme and usually non-permanent form of image persistence). While modern screens are not susceptible to the issues discussed above, screensavers are still used. Primarily these are for decorative/entertainment purposes, or for password protection. They usually feature moving images or patterns and sometimes sound effects. As screensavers are generally expected to activate when users are away from their machines, many screensavers can be configured to ask users for a password before permitting the user to resume work. This is a basic security measure against another person accessing the machine while the user is absent. Some screensavers activate a useful background task, such as a virus scan or a distributed computing application (such as the [email protected] project). This allows applications to use resources only when the computer would be otherwise idle. Opposite his chair was a stereovision tank disguised as an aquarium; he switched it on, guppies and tetras gave way to the face of the well-known Winchell Augustus Greaves. The first screensaver was allegedly written for the original IBM PC by John Socha, best known for creating the Norton Commander; he also coined the term screen saver. The screensaver, named scrnsave, was published in the December 1983 issue of the Softalk magazine. It simply blanked the screen after three minutes of inactivity (an interval which could be changed only by recompiling the program). By 1983 a Zenith Data Systems executive included "screen-saver" among the new Z-29 computer terminal's features, telling InfoWorld that it "blanks out the display after 15 minutes of nonactivity, preventing burned-in character displays". The first screensaver that allowed users to change the activating time was released on Apple's Lisa, in 1983. The Atari 400 and 800's screens would also go through random screensaver-like color changes if they were left inactive for about 8 minutes. Normal users had no control over this, though programs did. These computers, released in 1979, are technically earlier "screen savers." And prior to these computers, the 1977 Atari VCS/2600 gaming console included color cycling in games like Combat or Breakout, in order to prevent burn-in of game images to 1970s-era televisions. In addition, the first model of the TI-30 calculator from 1976 featured a screensaver, which consisted of a decimal point running across the display after 30 seconds of inactivity. This was chiefly used to save battery power, as the LED display was more power intensive than later LCD models. These are examples of screensavers in ROM or the firmware of a computer. Today with the help of modern graphics technologies there is a wide variety of screensavers. Because of 3D computer graphics, which provide realistic environments, 3D screensavers are available. Screensavers are usually designed and coded using a variety of programming languages as well as graphics interfaces. Typically the authors of screensavers use the C or C++ programming languages, along with Graphics Device Interface (GDI), DirectX, or OpenGL, to craft their final products. Several OS X screensavers are created and designed using Quartz Composer. The screensaver interfaces indirectly with the operating system to cause the physical display screen to be overlaid with one or more graphic "scenes". 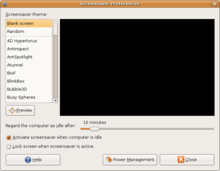 The screensaver typically terminates after receiving a message from the operating system that a key has been pressed or the mouse has been moved. If the system detects inactivity lasting longer than the time specified in the control panel, check if the active program is a simple program (and not another screensaver) by sending the "WM_SYSCOMMAND message" with the "SC_SCREENSAVE" argument. If the program calls in response the standard system function (DefWindowProc), the screensaver defined in the control panel screen runs. With no parameter – shows the Settings dialog box or do nothing. Previews the screensaver as child of window. <HWND> (presented as unsigned decimal number) is an identifier (handle) of the window in which to appear preview. Shows the Settings dialog box, modal to the foreground window. Changes password, modal to window <HWND>. Windows 95 screensavers must handle it. Under MacOS, screensavers are regular MacOS application bundles with the .saver file extension. Internally, the screensaver must define a class that is subclass of ScreenSaverView. The new class must be assigned as NSPrincipalClass in the xcode project, so that when the screensaver is launched by the system, this class gets instantiated. As one of the first screensavers appeared in 8-bit Atari computers, forcing systemic color changes when the computer is idle lasting a few minutes (different times depending on the model), stored in the system ROM of the computer. Monitors running screensavers consume the same amount of power as when running normally, which can be anywhere from a few watts for small LCD monitors to several hundred for large plasma displays. Most modern computers can be set to switch the monitor into a lower power mode, blanking the screen altogether. A power-saving mode for monitors is usually part of the power management options supported in most modern operating systems, though it must also be supported by the computer hardware and monitor itself. Using a screensaver with a flat panel or LCD screen not powering down the screen can actually increase the lifetime of the display, since the fluorescent backlight remains lit and ages faster than it would if the screen is turned off and on frequently.  . As fluorescent tubes age they grow progressively dimmer, and they can be expensive or difficult to replace. A typical LCD screen loses about 50% of its brightness during a normal product lifetime In most cases, the tube is an integral part of the LCD and the entire assembly needs to be replaced. This is not true of LED backlit displays. Thus the term "screen saver" is now something of a misnomer – the best way to save the screen and also save electricity consumed by screen would simply be to have the computer turn off the monitor. After Dark was an early screensaver for the Macintosh platform, and later PC/Windows, which prominently featured whimsical designs such as flying toasters. Perhaps in response to the workplace environment in which they are often viewed, many screensavers continue this legacy of whimsy by populating the idle monitor with animals or fish, games, and visual expressions of mathematics equations (through the use of fractals, Fourier transforms or other means) as in the Electric Sheep screensaver. At least one screensaver, Johnny Castaway told a humorous animated story over many months. The ability of screensavers to divert and entertain is used for promotion, especially to build buzz for "event-based" products such as feature films. The screensaver is also a creative outlet for computer programmers. 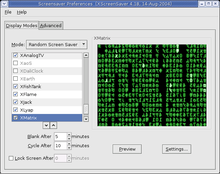 The Unix-based screensaver XScreenSaver collects the display effects of other Unix screensavers, which are termed "display hacks" in the jargon file tradition of US computer science academics. It also collects forms of computer graphics effects called demo effects, originally included in demos created by the demo scene. On older versions of Microsoft Windows the native screensaver format had the potential to install a virus when run (as a screen saver was just an ordinary application with a different extension). When any file with the file suffix ".scr" was opened, for example from an e-mail attachment, Windows would execute the .scr (screensaver) file automatically: this had the potential to allow a virus or malware to install itself. Modern versions of Windows can read tags left by applications such as Internet Explorer and verify the publisher of the file, presenting a confirmation to the user. On August 5, 2006, the BBC reported that "free screensavers" and "screensavers" respectively were the first and third most likely search terms to return links to malware, the second being BearShare. ^ Heinlein, Robert (1987). Stranger in a Strange Land. New York, NY: Penguin. p. 448. ISBN 9780441790340. ^ Chin, Kathy (1983-04-11). "Z-29, a new computer terminal from Zenith Data Systems". InfoWorld. InfoWorld Media Group, Inc. p. 13. Retrieved 2017-08-13. ^ "INFO: Screen Saver Command Line Arguments". Microsoft. ^ "ScreenSaverView - ScreenSaver | Apple Developer Documentation". developer.apple.com. Retrieved 2018-09-25. ^ Emrich, Alan; Wilson, Johnny L. (January 1993). "The Misadventures of Johnny Castaway". Computer Gaming World. p. 16. Retrieved 5 July 2014. ^ "Warning on search engine safety". BBC News. 2006-05-12. Retrieved 2010-06-07. This page is based on the Wikipedia article Screensaver; it is used under the Creative Commons Attribution-ShareAlike 3.0 Unported License (CC-BY-SA). You may redistribute it, verbatim or modified, providing that you comply with the terms of the CC-BY-SA.